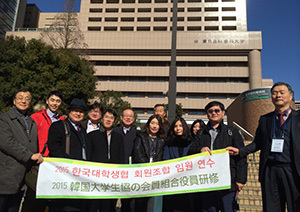 A total of 12 people from Korea University Cooperative Federation (KUCF) and its member coop’s officers (faculty) and staff visited Japan on January 28-31, 2015. They learned mainly about joint purchasing, learning and development of students, as well as mutual aid business. 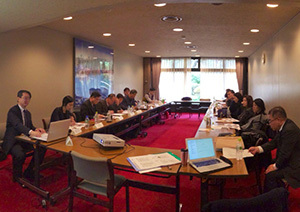 The delegation visited National Federation of University Co-operative Associations (NFUCA), Tokyo Medical and Dental University Co-op and the University of Tokyo Co-op in Hongo, and went to the store and ate at the cafeteria. Delegates who participated in the training on purchasing business conveyed that they wanted to work on purchasing and other businesses of co-op in the future. The training was proved to be fruitful. A participant said that in the previous trainings they only learned about purchasing business, but after listening to report on other activities of university co-ops in Japan, they wanted to start the students’ learning and development. He also expressed his hope that KUCF could delve into mutual aid business by the federation. Another participant said he realized that focusing only to purchasing business somehow triggered a sense of crisis, and got a hint on other activities that should be tackled by university co-ops in Korea. At the dinner, ten Japanese students also joined and made the exchange with KUCF more meaningful.